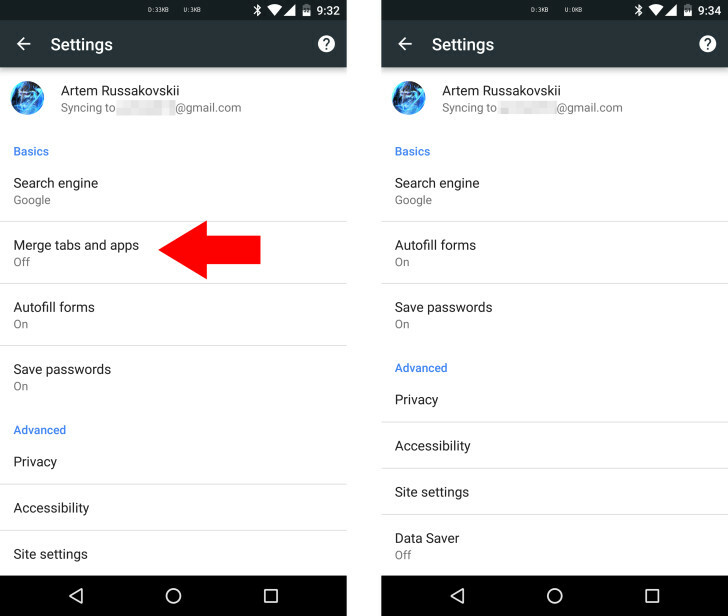 Google made a lot of changes to the Android UI in Lollipop, many of them successful. Chrome merged tabs was not one of those features. After first making the old style tab management the default again several weeks back, the latest Chrome Dev build removes the merged tabs option entirely. Merged tabs was an interesting idea in theory. Rather than having a tab switcher in the browser, you would just find your tabs in the main recent apps screen. The problem was that you could easily lose tabs in there, and switching between Chrome tabs and other apps got tedious. I think most everyone turned this feature off (okay, maybe just some of us). Now you won't even be able to turn it on soon. You can grab the new version of Chrome Dev (v51) on APK Mirror. The merged tabs option is just gone from the settings (see above, old on the left and new on the right). Since this is the dev channel, the change will likely move into beta and stable builds in the coming weeks. It's probably for the best.